This entry was posted on May 25, 2018 by Emily Rimmer. The type of sword that you have is an important factor that dictates which cleaning method is best to use. Swords tend to fall under 2 general classifications, stainless steel wall-hangers or spring/high carbon steel functional swords. There are exceptions, but in general your sword will likely fall into one of these categories. Stainless steel wall hangers are usually very decorative and designed to look good when hung on your wall. What they lack in functionality they make up for in ease of maintenance. Simply wiping them down with furniture polish/window cleaner and a soft cloth will remove any greasy fingerprints or grime. You can use special stainless steel cleaning compound if you want to get a highly polished finish on the blades. Cleaning functional swords, however, can be a delicate and more time-consuming task. 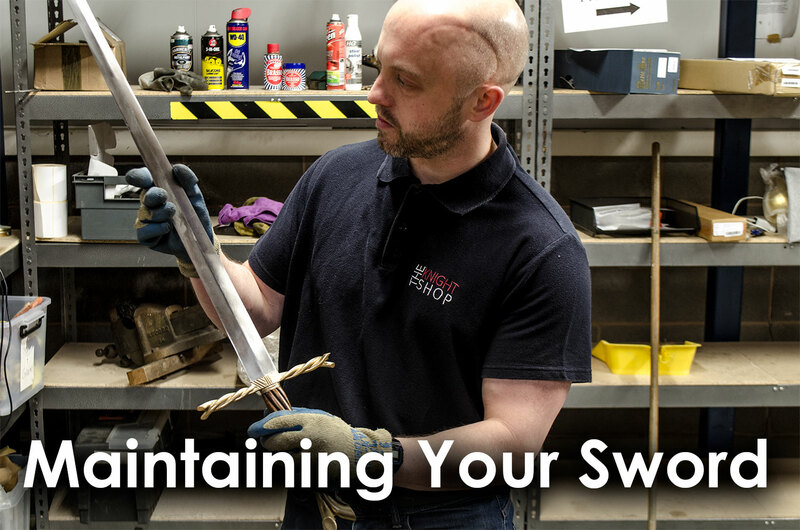 So we have put together a few tips to help with your sword maintenance. We would not recommend that you use any of the following methods on antique swords. 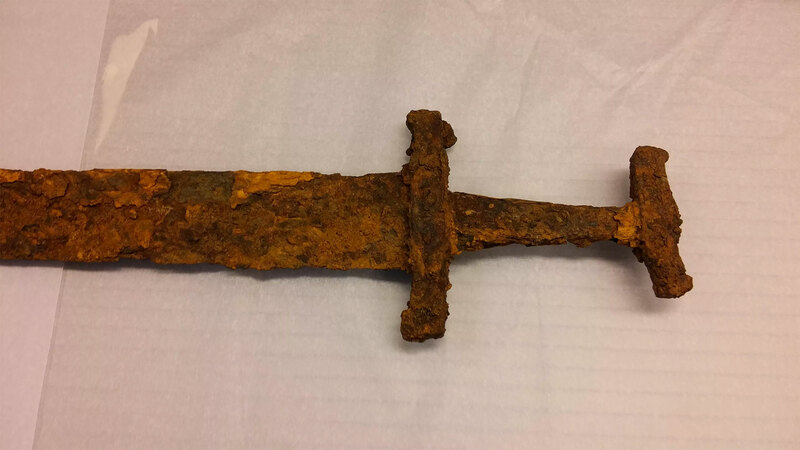 If you are lucky enough to own an antique sword, please seek specialist advice. Most sword-related injuries occur whilst performing maintenance and cleaning. It’s not really an issue with blunt swords. However, if you are working on a sharp sword we would highly recommend the use of cut-resistant gloves and remove any distractions. Carbon steel blades are prone to oxidisation and rust. The usual culprits are greasy finger marks that are left after touching the blades. If the blades are not protected with a layer of oil or polish/wax, oxidisation will take place quite quickly. If the rusting is light, it is relatively easy to clean. Despite what you may hear, WD40 is actually pretty efficient at cleaning blades. Used in conjunction with a synthetic scouring pad, WD40 should lift any surface rust with relative ease. If the rust is a little more embedded, we would recommend the use of a fine grade sanding sponge – available from most hardware stores, sanding sponges are great for removing rust patches. If the fine grade doesn’t work, we would recommend using a medium grade until the rust is gone, then go over the same area with a fine grade. Manufacturers want their carbon steel blades to reach you in pristine condition. As such they tend to apply a lot more grease than is actually required to ensure that they don’t rust in transit and whilst in storage. This grease is easy to clean off with a soft, lint-free cloth and some rubbing alcohol. Once you have taken all of the grease off the blade it will be unprotected (albeit a lot less greasy!) so you will have to apply another, a less liberal coating of oil or wax. These are more likely to occur if you are using your sword for cutting practice or drilling/sparring. If the marks are fairly light, they can be removed with some metal polishing paste such as Peek or Auto Sol. 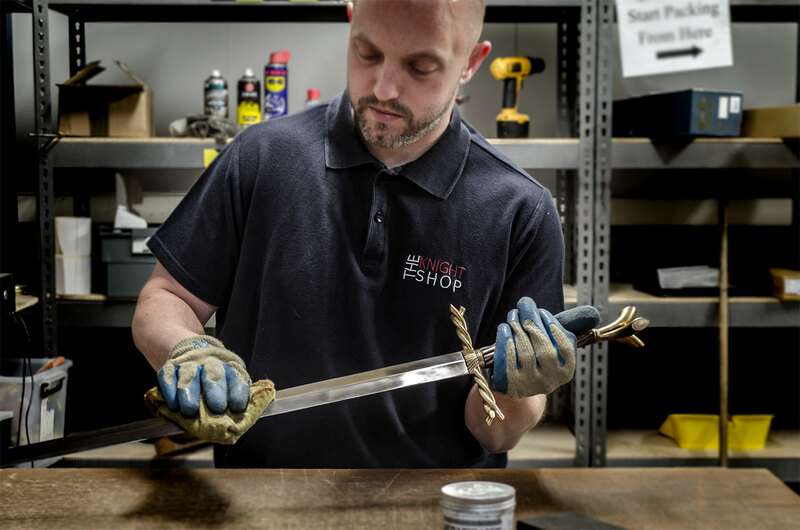 United Cutlery produces a polishing paste called “Metal Glo” that is specifically designed for swords and is available in the UK from The Knight Shop. We have found this product to be superior to all other polishing compounds on the market. Carbon steel blades need a protective coating to form a barrier that prevents tarnishing and rust. Applying a light layer of oil or wax is an ideal way to protect your blade. Specially formulated oil such as Hanwei Sword Oil is a natural choice for oiling your blade but in truth, any machine oil (3 in 1, sewing machine oil etc) or light mineral oil (liquid paraffin) will do the job. Some people swear by WD40 but we don’t recommend it as it evaporates over time. Another choice is waxing the blade with a product such as Renaissance Wax. This wax was developed by the British Museum for protecting their artefacts and is a great choice for sword blades. Apply it with a lint free cloth and it will set hard to form a protective barrier against rust. We would recommend that you oil your blade around once a month or after every use. If the blade is kept in a humid climate it will need oiling more often. In general, swords with carbon steel blades tend to have hilt fittings made of steel or brass. Steel hilts can be cleaned and oiled/waxed using the same method that is used for the blades. Brass hilts can be cleaned with a brass cleaner such as Brasso and then protected with a layer of Renaissance Wax. Be careful not to get oil on your leather grip as it will cause the leather to rot very quickly. Leather grips and scabbards can be treated with Renaissance Wax or a good quality leather paste wax. Scabbards can also be treated with neatsfoot oil to waterproof them (although this will darken the leather). Don’t use this oil on your grip as it will make it slippery. Wooden grips can be treated with a good quality wood oil to prevent cracking. Lemon Oil or Tung Oil are recommended but there are many types of oil that will suffice. Scabbards are really designed as a way to carry your sword and not get injured in the process. They are not ideal for long-term storage. Wooden scabbards can be ok if the sword is only very lightly oiled. Excess oil will cause the wood to swell. Leather scabbards trap moisture and will cause rust spots on the blade.